Berdimuhamedow was invited to bring the curtain down on Ashgabat 2017 by Olympic Council of Asia (OCA) President Sheikh Ahmad Al-Fahad Al-Sabah, who himself addressed the 45,000-capacity crowd. 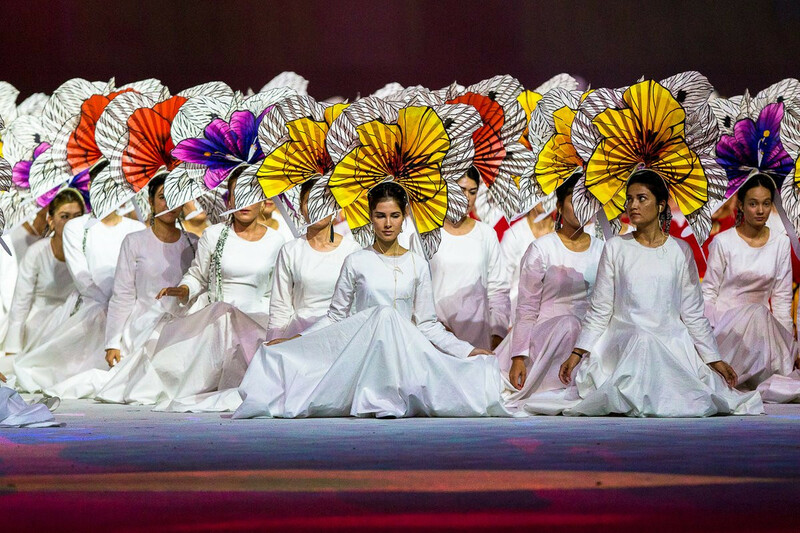 The Closing Ceremony, entitled "Wondrous Wind" marked the end of 12 days of competition, which saw hosts Turkmenistan top the medal table with 89 golds, 70 silvers and 86 bronzes. "We have come to the end of our Games in Ashgabat and we will never forget our wonderful time here," Sheikh Ahmad said. 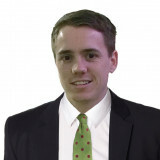 "The Games are an outstanding success." The OCA flag was lowered and taken out by military members as its anthem was played. "Thank you for inviting us to your country and your capital Ashgabat," Sheikh Ahmad added. "Congratulations on the best-ever Asian Indoor and Martial Arts Games. "Ashgabat, we will see you again. Athletes from the 65 delegations entered into the Stadium as part of the pre-show, walking from the field of play up to the seating area. All delegations were welcomed by placard bearers and marshals, while music videos were played on the Stadium screens. The beginning of the closing show was signalled by the extinguishing of the Ashgabat 2017 flame, which had been burning on top of a Guinness world record-breaking 600-tonne horse's head on the top of the Olympic Stadium since the beginning of the Games. 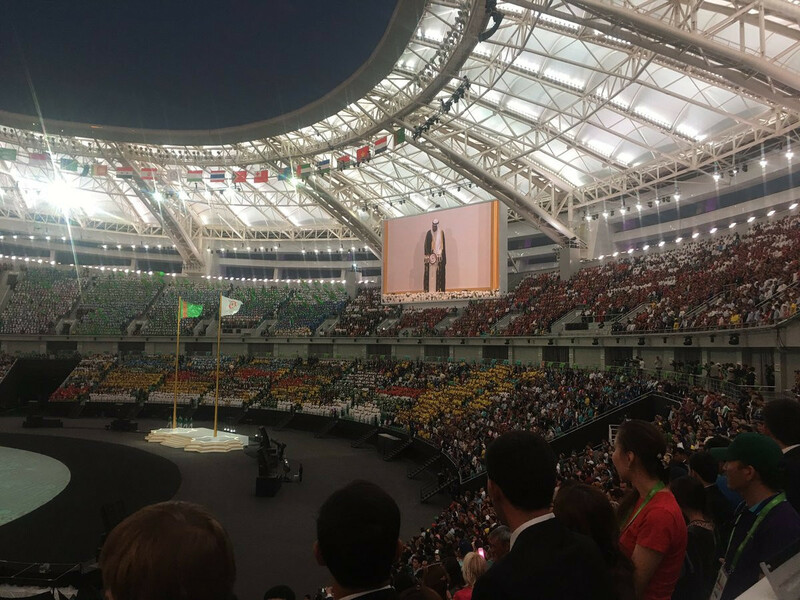 The show was split into eight sections, including a six-minute video highlights reel on the screens showing the beauty of Turkmenistan and the best moments of Ashgabat 2017. It was in the penultimate section that the Ceremony really came to life as a dazzling explosion of colours took over the venue, creating a joyful environment where the stage became a huge dance floor. International and national headline talent performed on the field of play, including English musician John Newman, best known for the track Love Me Again. Among the other leading performers was Russian singer and composer Nyusha, a regular feature at the top of her country’s charts with an array of popular hits, and Lebanese recording artist Elissa. Following the conclusion of the performances, pyrotechnics were displayed around the city to symbolise the end of Ashgabat 2017. In all, the Closing Ceremony featured 4,506 participants, 1,622 volunteers, 521 professional performers, 19 children and 20 headline talents. It was produced by Milan-based firm Balich Worldwide Shows (BWS), which performed the same role for the Ashgabat 2017 Opening Ceremony held on September 17. 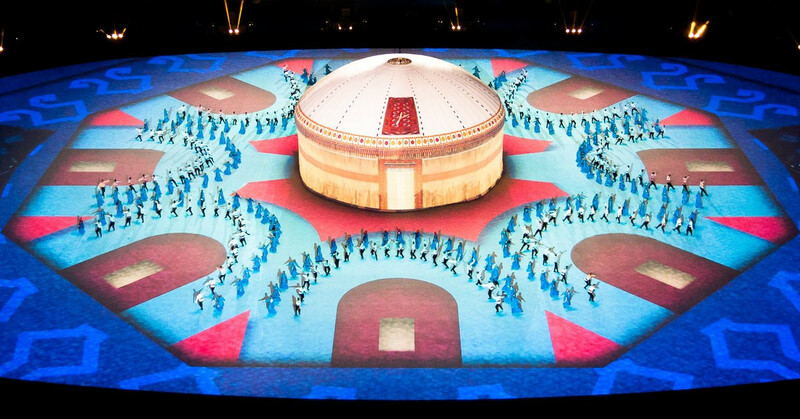 "Balich Worldwide Shows is delighted to be part of such a momentous occasion in Turkmenistan´s history; the hosting of Ashgabat 2017 fifth Asian Indoor and Marital Arts Games, its first major multi-sport event," BWS executive creative director Marco Balich said. "We are proud of the passionate people we brought together to design and produce the Opening and Closing Ceremonies. "A world-class team that have united their expertise, exceptional talent, creativity and endeavour to create breath-taking shows to represent Turkmenistan’s unique culture."